The largest opening in the industry and the longest stroke-- handle is adjustable to provide the least travel of any press. Adjustable handle is movable side to side for left or right hand operation. 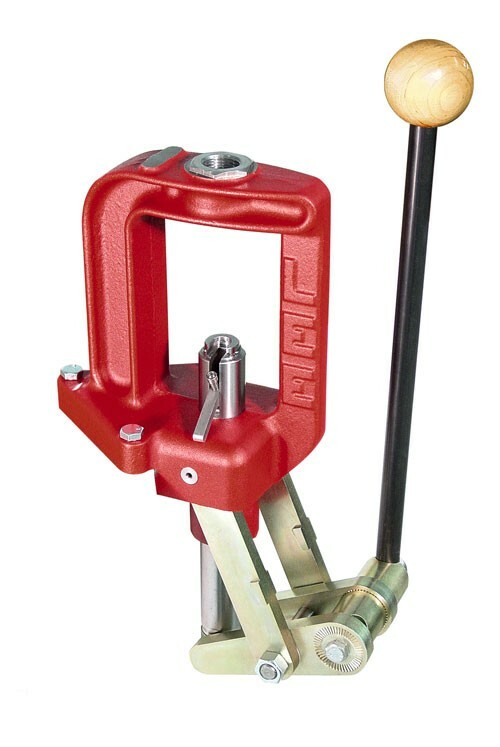 Start and stop position is adjustable with a 48-tooth ratchet type handle clamp. In addition, the handle length is completely adjustable. Shorten it when loading handgun and short rifle cases. The original Classic Cast designed to work with large series 1 1/4-12 dies. Includes threaded adapter to accept standard 7/8-14 dies. Large 1 1/8 diameter ram drilled completely through to allow spent primer disposal direct to trash can with attached tube. Ram is two-piece to allow installation of the mammoth 50 BMG shell holder. All support by over 12 square inches of ram bearing surface. Lee Precision, Inc. 90998 Classic Cast Press Setup in 50 BMG 360 Degree View from Lee Precision on Vimeo.